BCC Flicker Fixer is a filter for eliminating flicker from source footage. It provides 3 different methods for removing flicker. The Frame Analysis method is intended for use with clips with flicker that is uniform throughout the frame, or at least uniform within a contiguous block of the frame – e.g. flicker that is caused by unintended shutter speed or aperture variations from frame to frame. The two Temporal Smoothing methods are intended for use with clips in which the flicker varies from pixel to pixel within the frame – e.g. a scene that is lit partly by natural light and partly by a flickering artificial light, however the Temporal options are most suitable for clips without fast moving objects. The Frame Analysis method analyzes the whole frame, and is not suitable for clips where the flicker is limited to a small part of each frame unless that part can be encompassed by a sampling mask rectangle. If most of the frame is flickering and a small part is not, the Frame Analysis method will generally remove most (but not all) of the flicker, but is likely to add flicker to the non‐flickering part of the clip. You can, however, use the Mask and key controls to isolate the non‐flickering part of the clip and prevent this flicker from being added. The Temporal Smoothing method processes each pixel independently. If part of the image is flickering and part is not, you can usually get good results by processing the whole clip as long as there is minimal motion in the clip. The filter will produce some softening (since it works by smoothing) in the non-­‐flickering part of the image, and you can use the Matte controls to isolate this region and minimize the image softening. Faster Analysis: You can achieve some speedup of the analysis by checking this control, and it has little discernible effect on the render quality. Use the controls in this group to create a static or animated matte, which is then used to limit the flicker removal to the selected areas of the image. 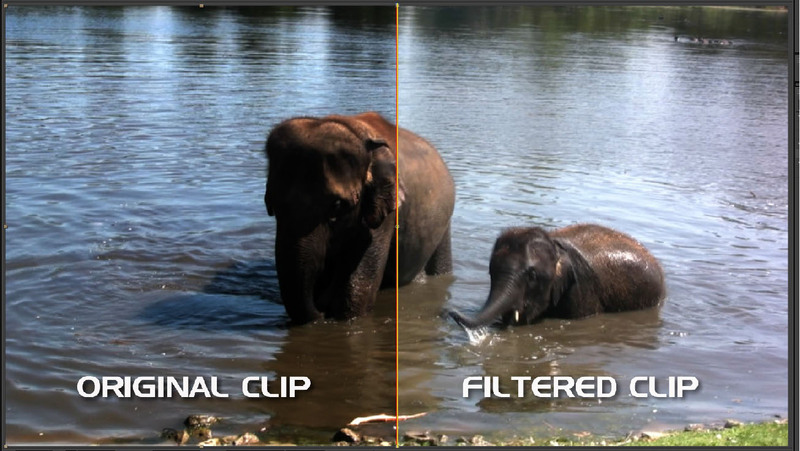 The generated matte can be any combination of masked regions created via the built-in mask tools within the filter (or in After Effects from any layer mask) along with pixels, which have selected via the key group by the user from the input image. Ignore Matte: The matte is ignored completely. Mask Shape pop-up: Used to select the shape of the mask that is used to contain the inside and outside correction. On-screen control widgets have been provided for the Egg Shape masks. The available on-screen controls for these mask shapes enable you to modify the position and scale of the mask as well as the feather amount, feather bias, and egg shape. Contains parameters pertaining to the mask that is used to separate the inside and outside correction. Mask Gamma: Used to adjust the falloff of the mask feathering. Contains parameters that are used in the generation of key mattes to isolate secondary colors for correction. Note: Setting the Base Key On pop-up to HSP provides the greatest tonal range of all the available options but it less bright than the HSL default. Note: Use of the Blur Key function can increase render times. Lock Tracker 1 and 2: lock each tracker. If you have successfully tracked one point, and are still working on the other, you can lock the completed tracker to save time and avoid changing its data.